There is nothing particularly easy about picking an engagement ring. I should know, because I’ve done it… twice. Back when my now-husband and I first got engaged, I knew that I was not going to let somebody else pick out what I was going to wear on my hand for the rest of my life (guys, I’m picky AF). So before any questions were popped, we went shopping together at the mall (did not like), at Very Fancy Jewelry Stores (did like, could not afford), and at vintage jewelry stores (perfect for me). But what I hadn’t figured out was that helping to pick out an engagement ring was not enough. I still had to pick something I wanted to wear, not something that my partner imagined that I wanted to wear. But really my problem was that I was trying to pick something “timeless.” Which meant that I was trying to pick a ring that I would love in some imagined future… not one that I loved right now, in the present. So with two rounds of engagement ring shopping under my belt, here is my best advice for figuring out exactly what engagement ring is perfect for you. Okay, great. So you got off the Internet and saw some real live rings, and heard some real live stories. Now you can get back on the Internet and start looking around. 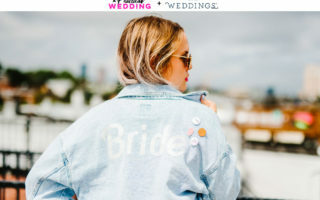 We have an engagement ring Pinterest Board that’s a great place to start, but we all know that you can dive into engagement rings online and never hit the bottom. Start by searching Pinterest. Then hit Instagram. Find jewelers that you like, and see what they carry. If looking at catalog photos of rings shining in brilliantly staged lighting leaves you feeling cold—you can also find photos of rings actually being worn or staged in different, warmer and more natural settings. (You know, like placed gently in a book, or precariously on a flower like wedding photographers are so fond of doing.) 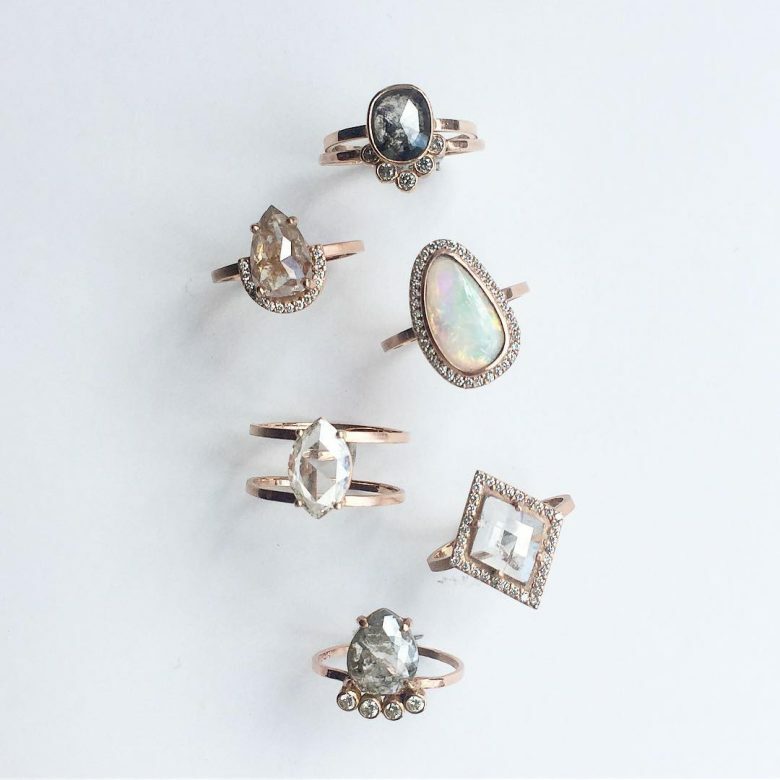 Pay attention to the different ring styles and colors that catch your eye. You’ll want to start noting what you DO like about certain rings. A note on using the Internet to search for an engagement ring: buying expensive jewelry online can be a scary prospect. What if it doesn’t look like the picture? What if it doesn’t arrive on time? But if you live in the kind of area that only has one physical jewelry store, and that store really believes in their heart that every kiss begins with a certain letter, then finding something that suits your taste might require taking a leap of faith. But the good news is it’s totally okay. Most online jewelers know that shopping for jewelry online is scary, and therefore have really robust return policies, stellar warranties, and great shipping insurance. So the TL;DR there is don’t limit yourself to looking in your zip code for what you’re into. Do you want a stone sitting on your engagement ring? Yes? No? If you answered yes, do you want it to be a diamond? 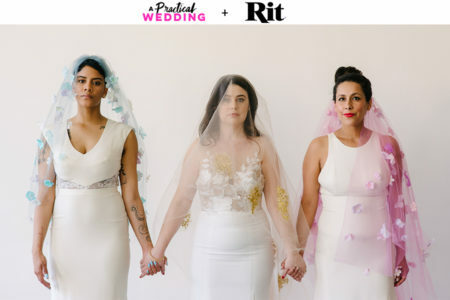 While the wedding industry has us all convinced that the answer is OMG OF COURSE YES, let’s back that answer up to a more neutral maybe. There’s literally an entire planet (Earth) full of different stones to choose from, and contrary to what’s everyone tells you—diamonds aren’t your only option. What about brilliant red rubies? Or deep blue sapphires? Or rich, vividly green emeralds? What if you have your heart set on a diamond, but don’t want to fork over an enormous amount of money (or support unethical mining practices)? If that’s the case, see yourself to the lab-created diamond section of the Internet and behold the majesty. Because, yup, synthetic diamonds are not just indistinguishable in a lab from mined diamonds, in some cases they actually have superior properties. (Including the property of being way cheaper.) Similarly, you might want to start researching Moissanite rings, which is a popular diamond substitute. Precious stones are generally cut into a few different shapes designed to be placed on rings. Some of your options include a princess cut, or emerald cut, or oval cut, or heart cut, or pear cut, or even cushion cut. I know. But honestly? It’s not your responsibility to know a lot about diamond size and shape. Do you like how it looks? Can you identify the difference between a circle and a square? You’re most of the way there to explaining to a sales person what you’re into. But to get you started, if you like a lot of brilliant sparkle to your jewelry, then you’ll probably want a princess cut or a round cut. Those two shine brilliantly because they have the most light-reflecting facets and cuts. (You can see a definitive sparkle ranking of cuts right here.) If you’re selecting a stone other than a diamond, than you may want to consider a heart, oval, or pear cut, as they highlight the unique qualities specific to colored stones. You already have an idea of the stone you want (or don’t want), and now you need to put it on an actual ring. The most common selections are gold, silver, and platinum. A main consideration here isn’t so much the materials but the color. If you generally wear silver for your everyday jewelry, then platinum might be a good matching option for your engagement ring. (Silver is a much more affordable alternative, but remember that if it’s not worn constantly, silver will tarnish.) Consider what metal colors look best with your skin tone, and remember that mixing metals is way on trend right now (and can give you many more options, particularly if you’re shopping for vintage rings). That precious stone you’ve selected now needs to be permanently affixed to that precious metal you’ve chosen, and it needs to look damn good. The ring setting is arguably more important than the precious stone. A super cool stone isn’t going to make up for a setting you don’t love. And a super cool ring setting can do a lot of the work of making your ring look like a million bucks. Selecting an engagement ring is not math. Or it doesn’t have to be, and it shouldn’t be a formula. Aside from the usual “pay attention to what you like” advice, pay attention to how you feel. Put on a test ring and sit for a moment. Sit for a few moments. Walk around (but not out of the store) and move your body. As a symbol of love, and commitment, and promise, your ring will have an energy to it that your body will feel. Pay attention. Listen to yourself. I’m not talking about what makes sense in the does-it-look-pretty or will-my-friends-and-family-approve kind of way. I’m talking about what feels good deep in your bones kind of way. This ring or that stone or that style. You can choose anything you want. You can pick a newly designed ring or something off the shelf or accept a meaningful family heirloom. This is your engagement ring, and it means something.